Hello All! Where has summer gone? We can’t believe it’s the middle of August already. We hope you are enjoying the beautiful weather. Hopefully your family is getting geared up for all those fall activities and back to school preparations. We have talked to many students both K-12 and college and amazingly they are excited for school to start. That’s great. My girls were always ready for school to start as well and I appreciated it too! Well, many of you are hearing rumors of our shop closing. We are excited to say that we are not going out of business, we are changing our business. So yes – we will be closing our retail location. August 31st, 2012 we will be our last open day. We will continue to attend quilt shows, markets, retreats, guilds, etc. 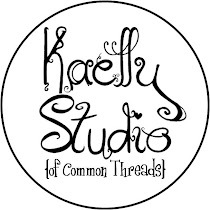 We are busy working on our new pattern company – Kaelly Studio. Our publishing company is getting excited to get our patterns out to the public so we need to get them done. That is the main reason we need to close our retail location. We simply need more time. We have tried since the beginning of the year to allow more time but it hasn’t been working so well, so we made the decision that something had to go and sadly for you it was our every Wed-Sat shop hours that took the hit. BUT we are going to be having previews and shopping experiences from time to time and we will keep you posted on those important dates. Our Garfield building will be the new home for our studio, warehouse AND Holly’s own machine quilting business “Just Spoolin’Around”. 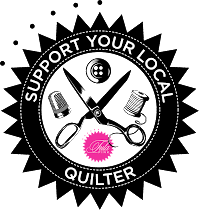 We will continue to remain a presence in the quilting world just in a different way. For those of you who are getting antsy for our fall retreats, we will be sending out that information the end of this month. We are waiting on the contract from the camp so as soon as that arrives – we will be ready to take registrations. Sneak peak…..our retreat theme is not only “Finish Your Projects” BUT O.W.L. (Only With Love). We have some fun things planned to make the weekends even more special. Watch for information soon! Thank you from the bottom of our hearts for all your encouraging words about our changes, our new pattern company and your continued support of our quilting endeavors whether it be attending a quilt show or retreat; scheduling a quilt for Holly’s Just Spoolin’ Around machine quilting business or shopping on our soon-to-be released new online store. None of these things could ever be possible with you so THANKS! P.S. We will be starting a brand new blog for Kaelly Studio and a new website. Also, Just Spoolin' Around will have a website. More information coming soon! Good luck with your venture, but I hear this with a heavy heart! I have formed many friendships over the years with many people. I will miss the monthly meetings and fellowship. Show and Tell was always very inspiring to me!! !